LIGHTINCHINA > Updates > Weekly Updates > Quick Prayer Requests! Thank you so much to everyone for praying for us! 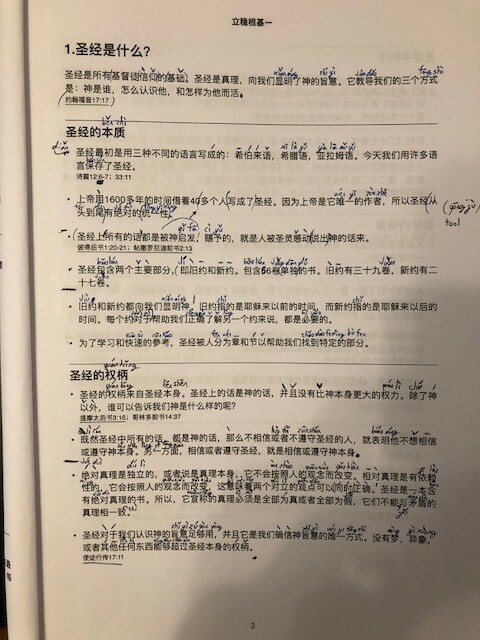 I have started practicing with the Chinese pastor here how to teach in Chinese a basic Bible lesson called, “What is the Bible?” Please pray I can learn the lesson well enough to be able to teach it to an unbeliever so that I can tell them that the Bible is God’s word and also tell them about the Gospel of the Bible! Right now I can teach about half the lesson comfortably. My goal is over the next few months to learn how to use my Chinese to be able to teach basic Bible lessons such as, “Who is Jesus”, “What is Sin”, “How to be saved”, etc. and then find people to teach these truths to! Please pray for God to bless this effort. Please pray for two guys whose English names are Jack and Eric to be saved. They have been coming to the church and studying the Bible over the last couple of weeks and seem to be interested in the Gospel. Please pray for them to trust Christ as their Savior. Please pray for a lady Nancy met and invited to church during our first month here in China. She has been coming to the church off and on and has heard the Gospel several times, but still hasn’t accepted Christ. Please pray for her salvation. Copy of the lesson I am working on! I request you please remember My son and daughter in law (Divya &Reena) in your prayers to conceive. They have not had children for more than 5 years since the problem of ovary beyond medical treatment ..I believe nothing is impossible with God. Please pray for them to have a testimony and full time ministry.